Tells about jpg extension upload problem. But i have set file extensions as jpg, jpeg, png, bmp etc. Kindly recreate that file upload field, delete it and create a new one. That should fixed it. Let us know if you have any other questions. Thank you so much! I have the same problem. Many days ago, i report the similiar problem, the problem persist, PLEASE SOLVE the fix !! , best regards! Notice how there's a space before jpeg, png and gif but none preceeding ppt, pptx, rar and zip? This might be the cause of the problem. Correct the spacing, click OK, save the form and let us know if that helps. Also, make sure there's no space after zip after making the changes. By "Correct the spacing...", I mean that you should insert a space before ppt, pptx, rar and zip. 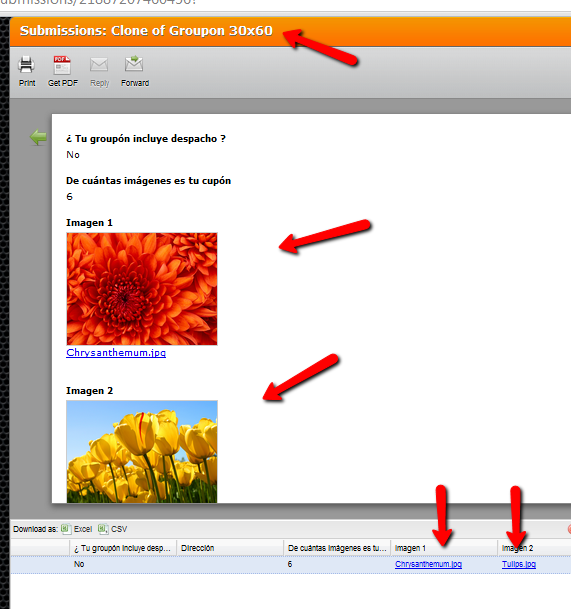 The for is "groupon 30x45" and "groupon 30x60"
I tested your clone form upload field. I did not encounter any issue uploading files. Can you please share to us what is exactly the issue you encounter on your end. We will check further. Asunto: Re: JPG file upload problem, why ? What schmag is talking about, seems to be an intermittent upload problem , and I don't know if it is related to the dropbox integration. I cloned his form, integrated it with Dropbox and and was able to reproduce the issue in FF. It will not show any issue without the integration though. At any rate, He also experienced the same problem not only in FF but in other browsers.